The Acid C-Note brings the huge flavor of Acid to a unique 3 3/4 x20 small cigar. Wrapped in a delicately spicy Sumatra leaf and infused with Drew Estate’s signature blend of herbs and botanicals, the aromatic C-Note provides a hassle-free burn and surprisingly generous draw for such a little fella. The smallest member of the Acid Purple line, Acid C-Notes are mellow-to-medium in body, offering 20 minutes of delicious Acid taste in each little stick. love these cigars , taste, burn , smell, etc.. Smooth cigar, can be difficult to draw on occasion, snipping an end off helps. Good flavor and easy burn. Good little in between smoke. this is my second time i bought a 2 fer of c notes and i enjoy them very much thanks. I have ordered at least 6 times from y'all. Perfect every time! Even when the snow storms froze the northeast. Great job! You guys are fantastic! You always get the product to me on time and you're just a phone call away. 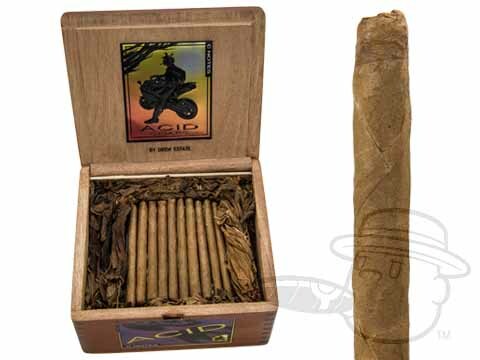 The Acid Crush is a very aromatic, smooth cigar in a convenient form factor. I've always wonder exactly what makes them smell so good. Before I even light up I just love to smell it and it takes me back to very happy places. FANTSTIC!!!!! Really Enjoy These! Great Item! i love these c-notes perfect for quick tasty smoke. great price as always from bsp. thanks! I really enjoy these cigars when I don't have more than 10-15 minutes for a smoke. I found them be a very tasty, mild smoke for a reasonable price. If you haven't, I would suggest picking up a 5-pack and trying them out. I don't think you'll be disappointed. Great for quick smokes, very tasty on the lips. Love it! Love these little guys! Perfect for sitting around the campfire with friends. Tasty and not going to cost a fortune. I have been ordering from Best Cigar prices for well over a year. Never have I been disappointed. I order at least four boxes a month. Great job. Another favorite for me. Like the Acid blue crush, only a little smaller. A perfect smoke for me on the way home from work, 15- 20 min. and affordable. I always buy c notes. They are great when you only have ten minutes. They always have a great taste. They all do besides this batch. They are not dry enough and hard to draw. I have to leave the bags open so they dry up some. Terrible batch. Great tasting 15 min smoke. Excellent construction and flavor. These are great smokes high quality and great for a quickie. I find them easy to smoke when I don’t have 45 minutes to enjoy a big boy ! Best Cigar Prices have had the best prices on Acid C-notes, period! I love the prices on this website. Famous and CI said they would match best cigar prices, but I won’t patronize them. If they could match prices they should lower their prices for good. Best cigar prices is the best. Great value, do all your ahopping at Best Cigars! Have been buying these for years now. Nice flavor & good burn. Its got a great smell and taste. If you want an acid cigarillo these wont dissapoint! Acid C-Notes give full flavor without being overwhelming. They're a great choice. nice smooth smoke full of flavor,just a little too short. Acid C-Note is rated 4.4 out of 5 based on 61 customer ratings.